“Institutions are designed for stability. They are designed to protect the status quo. They are designed to resist change and are allergic even to the hint of transformation. They are not designed to reflect the will of citizens, consumers, students, patients, and entrepreneurs.” — Saul Kaplan, “The Business Model Innovation Factory” Some folks like to suggest that it is the biggest, most dense cities where the most serendipitous interactions tend to occur, the types of random encounters that lead to crazy innovative breakthroughs. I’ve found in my own personal experience that it is in fact smaller cities where in practice this more often occurs. Because the pools of people in particular niches are smaller, cross-niche collaboration and interaction is a necessity. A few months back I experienced this again when I went out for drinks with a guy running a tech incubator in Providence, and he happened to have Saul Kaplan in tow. Turns out Saul is an old Accenture guy like me (though we never worked together) with a ton of private sector experience both in staff and strategic consulting roles. But he also spent a few years as head of economic development for the state of Rhode Island so has seen the public sector as well. These days Saul runs a cool outfit called the Business Innovation Factory, and also does quite a bit of writing on strategy at his blog, the Harvard Business Review and elsewhere. Recently, he put out a book called The Business Model Innovation Factory. I generally don’t review business books here, but this one is highly relevant to cities and other entities we don’t necessarily think of as businesses. The first part of the book is a description of what a business model is. This is worth its weight in gold if you haven’t thought about that. The simple definition given is that a business model is a “story about how organizations create, capture, and deliver value.” As he goes into more detail, he draws heavily on the type of business model definitions used in the lean startup model, of which I approve heartily, most notably that of Alexander Osterwalder’s Business Model Generation. Skipping to the end of the book, Saul notes that all too many public sector entities and non-profits don’t think they have a business model. In fact, they often define their very raison d’etre as opposed to business and operating purely to make a buck. But ask yourself these questions as a city or civic development group. Do you deliver any value? (I certainly hope you think you do!) Do you want to capture any value? (How do you propose paying your bills?) What is it that you actually do that creates the value I’m sure you believe you make? After thinking about the book, the focus changes to the disastrous results that can result when the current business model breaks down. He uses the well known example of how Netflix totally disrupted Blockbuster, leading to the latter’s bankruptcy. And also how Apple completely disrupted the traditional music value chain. We can perhaps think of many similar examples from the public sector. States and localities often rely on sales taxes from bricks and mortar retailers as a value capture mechanism. Tax free internet sales from the likes of Amazon put a dent in that. Similarly, government relied on gas taxes at a flat price per gallon to capture value from the highway network. Fuel efficient and alternatively powered cars have disrupted this and made it difficult to finance infrastructure improvements in the US. These are perhaps modest examples, but show what government has to deal with every day in a realm of ever faster technological and business change. It’s interesting to note the standard reactions governments have had to the problems I outlined above. In the first case, the proposed solution is invariably let’s tax internet sales. For the latter, it’s let’s tax by miles driven rather than by gallon. Both of these I think are fairly limited responses. They get to the heart of how most businesses approach innovation. Their desire is to find ways to sustain, optimize and improve the business current model. It is never to think of a new business model in terms of what value should be delivered, how to deliver it, and how to capture value from it. For example, a switch from a gas tax to a VMT tax is a bit of a shift, but not much. It doesn’t change the value bundle being delivered — more roads — or the basis of value capture, which is “inputs” based rather than “outputs” based (i.e., the actual value delivered). Also, it links value capture directly to a particular class of direct infrastructure users without considering all the externalities generated. For example, many people have gotten insanely rich because the government routed a new freeway past their property. The property owner did nothing to create that increased land value through their own efforts, yet captures 100% of the value privately, except in limited cases. If businesses all too often fail to think about the fundamentals of their business model until they are destroyed from without (a type of “innovator’s dilemma”) how much moreso hidebound institutions like governments, universities, and other non-profits? Indeed, like most people, they seem not to have articulated, much less questioned their fundamental truths. Kaplan goes on to talk about business model innovation — not just incremental innovation within a particular business model — as a core competency organizations must have in a rapidly changing, ever more complex world. He talks about a bit about what this should look like and what the barriers are in the book, so I’ll encourage you to read that for yourself. They key is that to be successful in the 21st century, organizations need to be willing — and able — to fundamentally rethink their business models. Given the difficulty of doing this generally in the public sector, the cities and states that are successfully able to pull this off will create enormous competitive advantage for themselves. If you think your region is already innovative, think again. Kaplan makes a great observation. Look at the regions that consistently score so highly in innovation hub surveys. Are they doing anything fundamentally different in terms of health care, driving significantly better patient outcomes for more people at lower cost? Is their K12 educational system a hotbed of innovation and better results? Their fiscal environments? Generally, as a rule, these places aren’t as different from others as say Apple is from its competitors. Therein lies the challenge to them I think. There were a couple of things I did take a bit of an exception to. Kaplan tends to downplay incremental innovation a bit. But the reality is that the vast bulk of improvements in our society, including ultimately fundamental change, result from compounded incrementalism. The radical transformation is often less so than it generally appears. I think we’re inclined to focus on cases where we can attribute a breakthrough to some radical rethink because of our culture’s longing for the Romantic hero (think Steve Jobs). Perhaps this is inevitable in a book that sets up to contrast business model innovation with traditional innovation. We’ll certainly come away more excited about the former than the latter. But the sad reality is that few organizations even do traditional innovation within the existing business model. So how much harder is rethinking that model completely? Also, Kaplan takes aim at Detroit. After a visit there listening to various civic leaders talk, he came away thinking — and I’ll put a fairly harsh paraphrase on it — they were clueless. However, I might suggest he was looking in the wrong place. Detroit is perhaps the most innovative city in America in a number of ways. It’s certainly not because of the Mackinac Island annual policy conference crowd. It’s in the grass roots. It’s happening because of the extreme collapse and ineffectiveness of those institutions. This has cleared the way and created a nearly zero price greenfield for experimentation, a phenomenon I documented in “Detroit: Urban Laboratory and New American Frontier.” I don’t want to minimize Detroit’s problems, but there’s a lot of ferment going on. It seems to be the same in Saul’s home town of Providence. There are a lot of interesting people doing interesting things, but many of them seem to be operating completely outside the system. In this regard, having a “free enterprise zone” where people who want to play and experiment in a low cost environment can go wild is a way to start renewal in places that have suffered a lot. 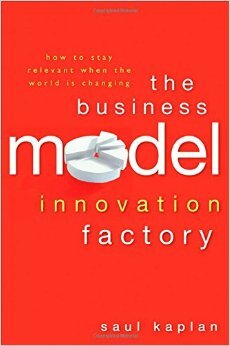 In any case, The Business Model Innovation Factory is a timely and relevant book for city and state leaders as their existing business models are clearly under extreme pressure from the marketplace. It’s written in this style of a business book, which may be off-putting to those not used to it, but it’s easy to read, provocative, and has many lessons that need to be absorbed by organizational leaders across America. As interesting as it is to hear and think about innovation (a variation on “invention”) the term is beginning to be overused and to lose meaning, much as “sustainability” has. Innovation is introducing something new and usually sharply different. We could get more value in a lot of public services simply by having them be provided more efficiently. Jim Collins wrote about this in “Good to Great”, about getting the right people in the organization and then constantly making small improvements, day to day. No great leaps forward, simply a steady focus on quality. In order to innovate, an organization has to first be capable of accepting and implementing change.